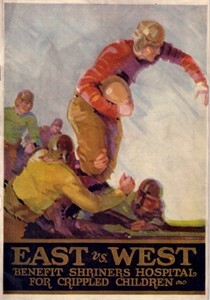 Original complete program from the 1930 East West Shrine All-Star college football game played Jan. 1 in San Francisco. Among the many legendary names on the rosters were Jack Cannon of Notre Dame, Dutch Clark of Colorado, Bronko Nagurski of Minnesota and Roy (Wrong Way) Riegels of California. 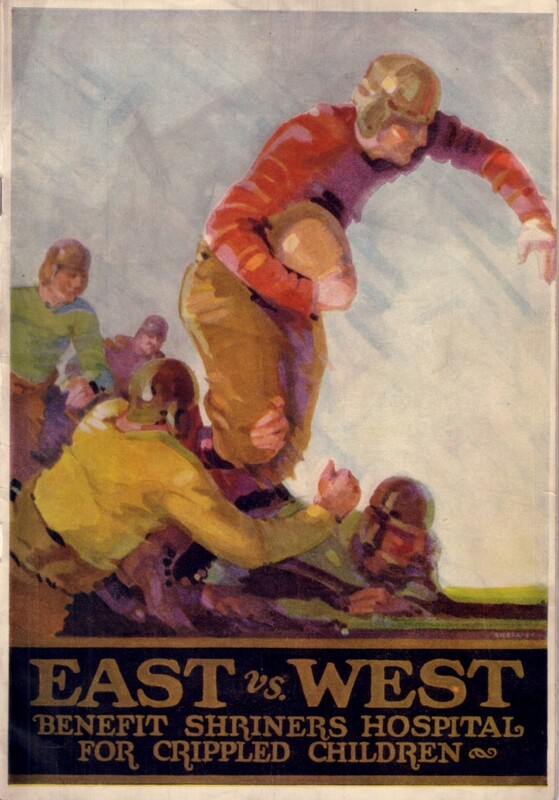 Both covers have numerous minor wrinkles that can be felt but are barely visible. The corners and spine are slightly worn, and the bottom of the cover at the spine has a tiny split at the very bottom of perhaps 1 centimeter. 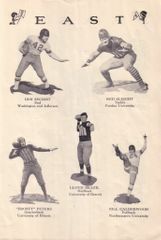 The inside pages are in great condition except the roster page is wrinkled, has a small edge tear, and the original owner corrected the jersey numbers of several East players and scored the game on the next page through the third quarter in pencil. ONLY ONE AVAILABLE FOR SALE.